Description: When it comes to ministry, are you feeling... Left out? Too old? Too young? Too inexperienced? Bored? As if you've been passed over? 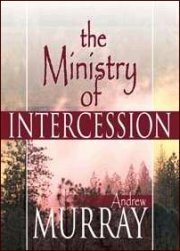 Discover with Andrew Murray that prayer is the most dynamic opportunity available to God's children today. It not only strengthens our own faith and energizes our times with God, but it also enables us to intercede for others with tremendous results. Through intercessory prayer we can help to usher in the anointing, launch revival, and bring God's kingdom into tangible reality. Encounter the high calling and powerful purpose that God has designed for you!